CohnReznick and GTM Research recently came together at San Francisco’s City Club to talk about the ever-evolving project finance and M&A landscape for the U.S. solar and storage markets. Cory Honeyman, Associate Director of U.S. Solar for GTM Research, kicked us off with a presentation about the state of U.S. solar and storage, both at utility-scale and behind-the meter. Honeyman then sat down with Frank Palladino, director at CohnReznick Capital, to talk about the shifts happening in solar project M&A and cost of capital outlook. They noted that despite corporate tax reform, multiple corporate investors and regional banks are still entering the tax equity market. That being said, Palladino noted leading tax equity investors are also showing no signs of exiting the solar tax equity market, although revised financing terms may put a squeeze on sponsor returns. Speaking of sponsor returns, the project M&A landscape remains a seller's market heading into 2018. 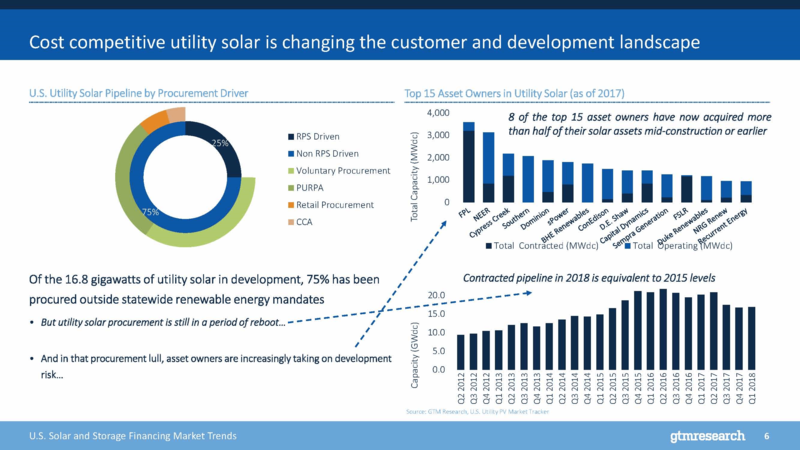 While large-scale solar is expected to remain flat this year, the number of asset owners actively bidding on projects has doubled. With flat growth and a bevy of bidders, the market is seeing continued compression to sponsor returns. That has pushed asset owners to be increasingly reliant on post-contract revenue to hit their required returns in a dirt-cheap PPA price environment. The conversation then shifted to a panel led by GTM Research’s Colin Smith to talk about solar financing looking forward. "With such cheap PPA pricing, developers are addressing a myriad of new risks when it comes to financing the next wave of growth for U.S. solar," said Brett Weal, principal with CohnReznick’s renewable energy practice. The discussion understandably focused on solar-plus-storage, even though it’s still a small fraction of the market. Financiers are wary about any revenue stream for solar-plus-storage that isn't contracted. Meanwhile, the other up-and-coming segment, community solar, is dealing with unpredictable revenue streams due to customer turnover risk. But with a record 400+ MW installed in 2017, community solar has a growing pool of operating assets for developers to prove out subscriber acquisition and retention models to lower the cost of capital for the fastest growing segment in U.S. solar. Panelists flagged community choice aggregators (CCAs) as being a growth opportunity within large-scale solar that has had the most challenges raising capital. Given the limited operating histories for CCAs, creditworthiness is a big sticking point for a number of lenders and tax equity investors. But, the initial wave of CCAs have several years of operating history under their belt, and the application of shadow credit ratings and a persistent seller's market for sponsors means that the capital is still there, albeit warily so, to finance projects with CCA off-takers.